BRAVEHOUND provides training and dogs to support veterans, some of whom may be dealing with post-traumatic stress, mental health issues and physical injury. 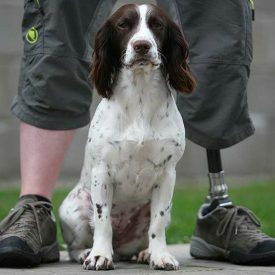 Companion dogs are provided with support for both the dog and veteran, over the dogs’ life. Weekly training sessions are free to veterans and open to everyone, as well as one to one training. In September 2017, BRAVEHOUND was voted the UK’s best Voluntary/Charity project in the National Lottery Awards presented by Invictus Games medallist JJ Chalmers. 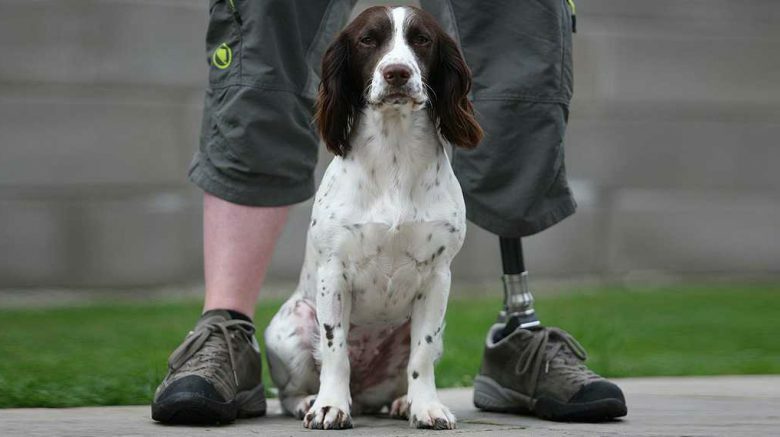 We aim to match suitable veterans with companion dogs in order to support the transition into civilian life. Where possible and suitable we look to re-home dogs from an animal welfare charity. We offer the opportunity to own a dog and then get expert support in training the dog, to whatever level is required. As well as training and supporting veterans, prior to receiving the dog, BRAVEHOUND support the veterans with pet insurance, feeding, and equipment. BRAVEHOUND’s first dog Irma was paired with Paul Wilkie (former SSgt Royal Engineers), a veteran of 22 years military service. At the 2017 Animal Hero Awards hosted by Amanda Holden, Irma received the prize for ‘Caring Animal Of The Year’. Paul and Irma are this year finalists in Soldiering On Awards 2018. We have worked with veteran David Heyhoe in developing our training programme (Heyhoe’s dog Treo was awarded the Dickin Medal in 2010 for his life-saving work in Afghanistan); the Wilfred Owen Association to commemorate the World War I poet’s centenary and with Damien Lewis & Jason Morgan at the Honourable Artillery Company to discuss their book A Dog Called Hope to raise awareness for assistance dogs.